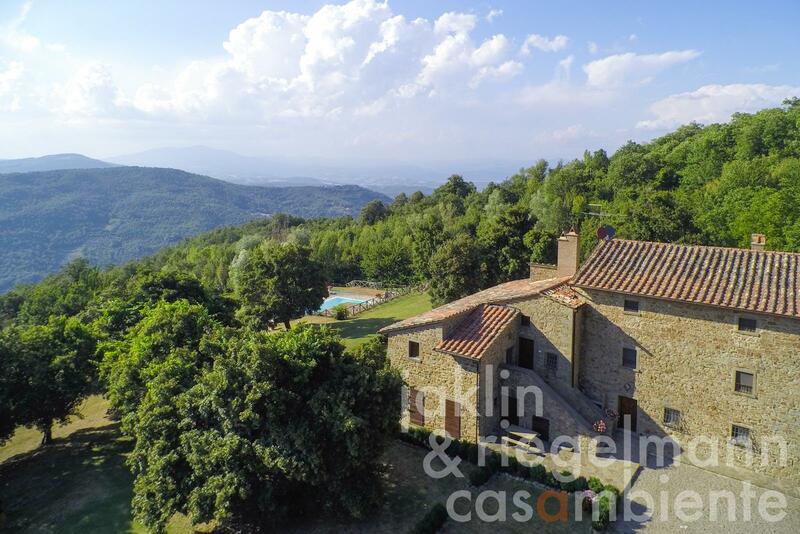 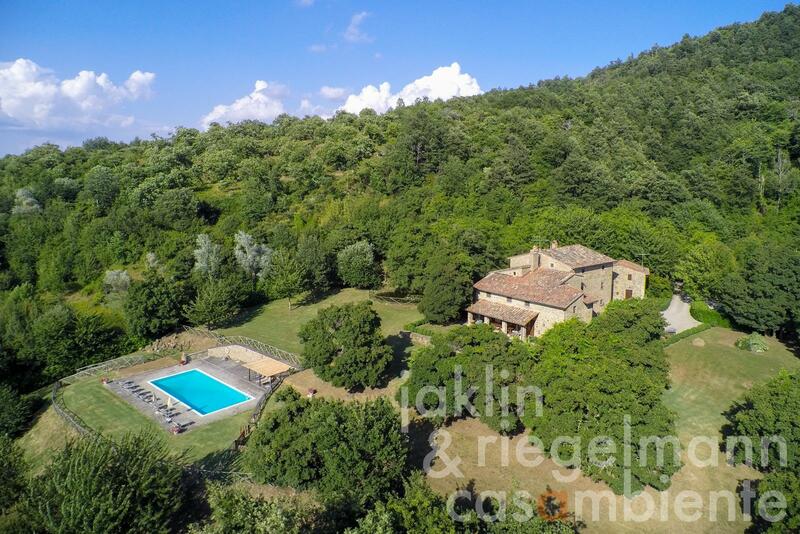 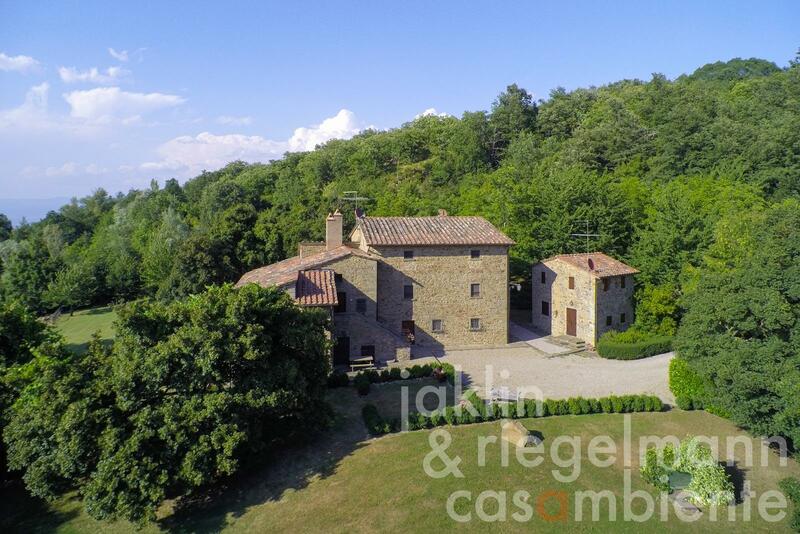 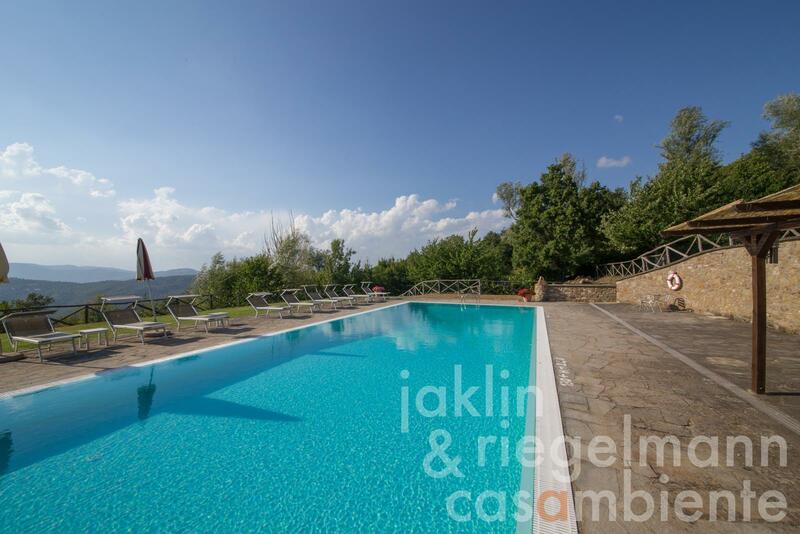 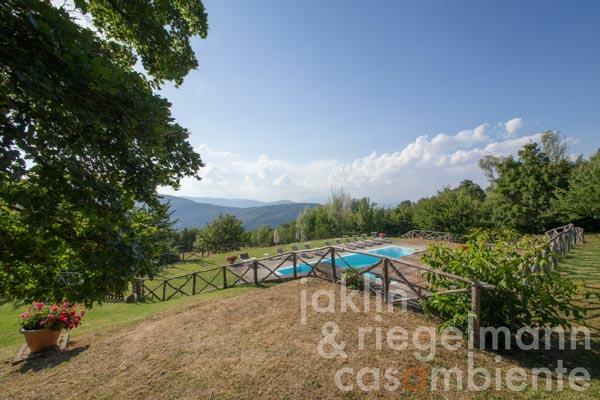 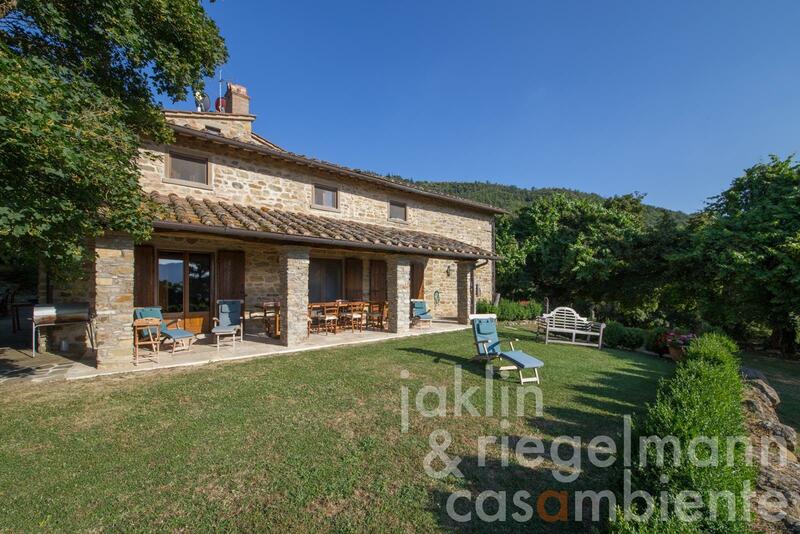 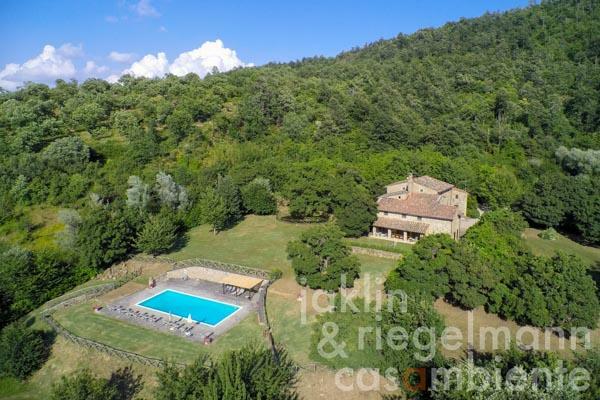 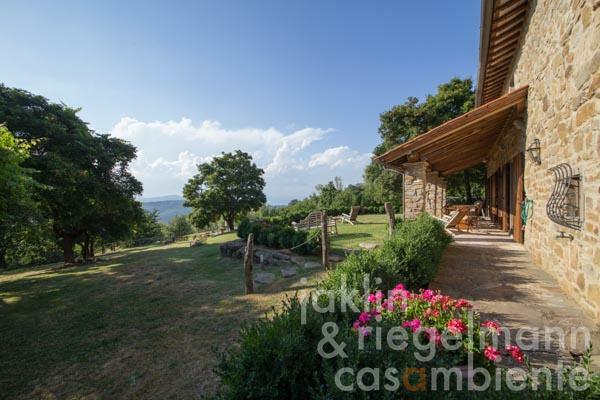 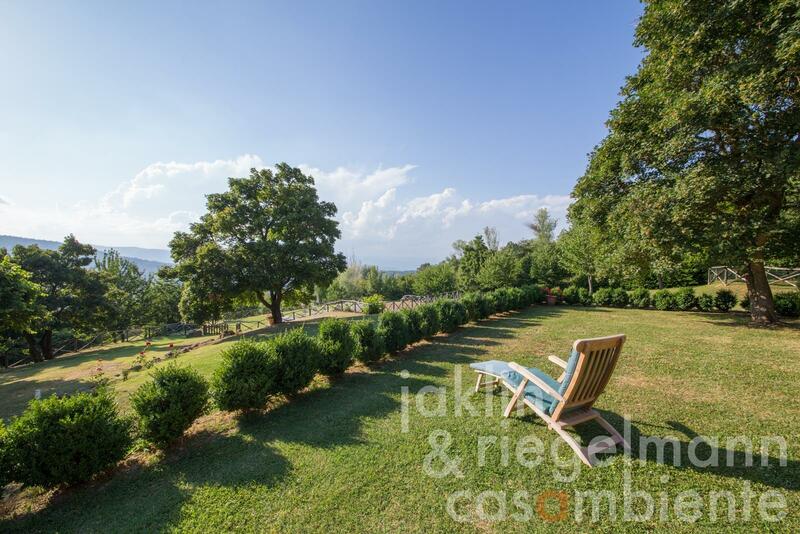 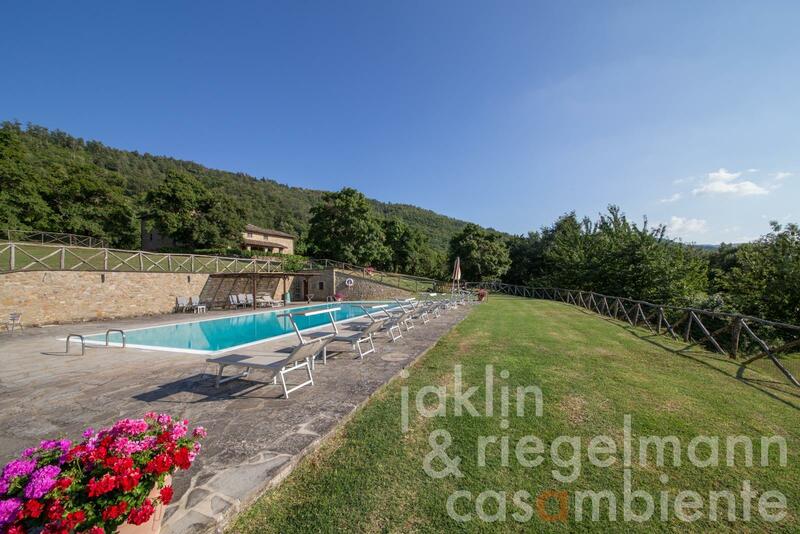 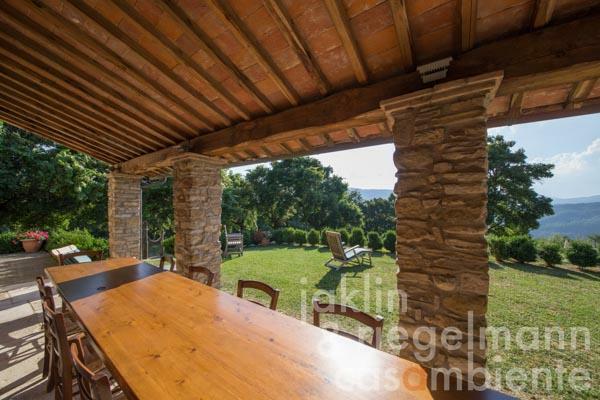 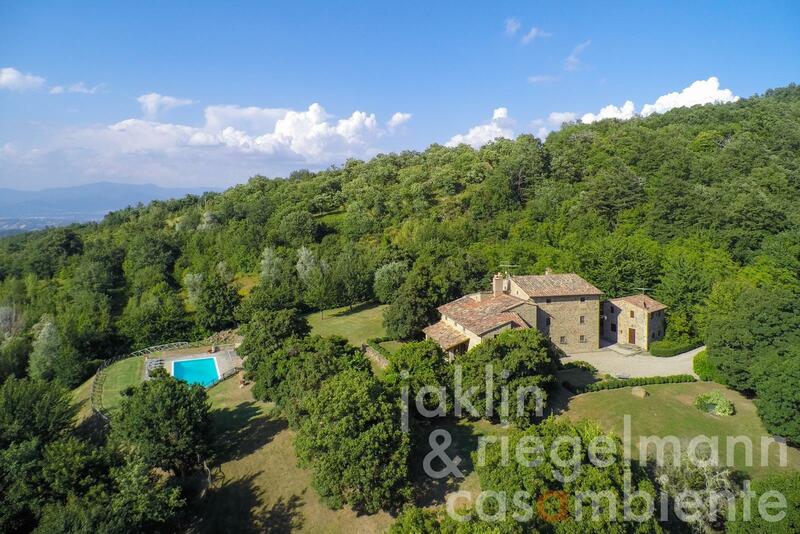 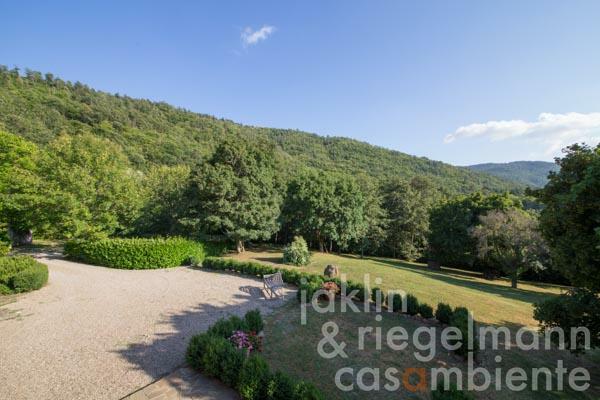 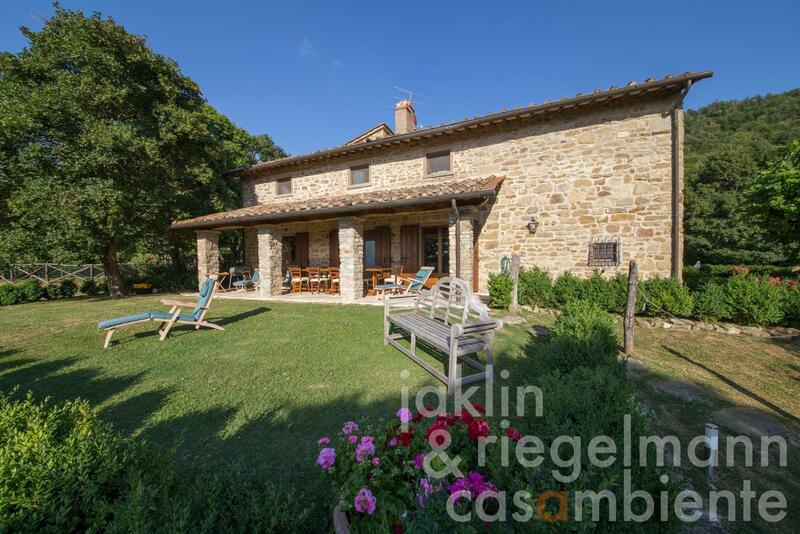 This beautiful manor house for sale with guest cottage and panoramic pool is privately situated on a hillside on the border between Tuscany and Umbria. 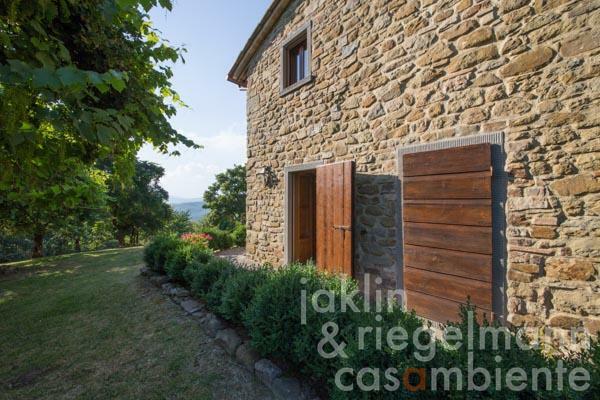 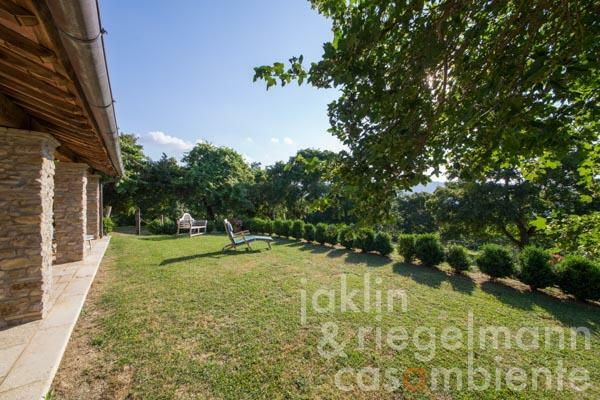 The property is surrounded by green countryside and enjoys splendid views of the Tiber valley towards the town Anghiari. 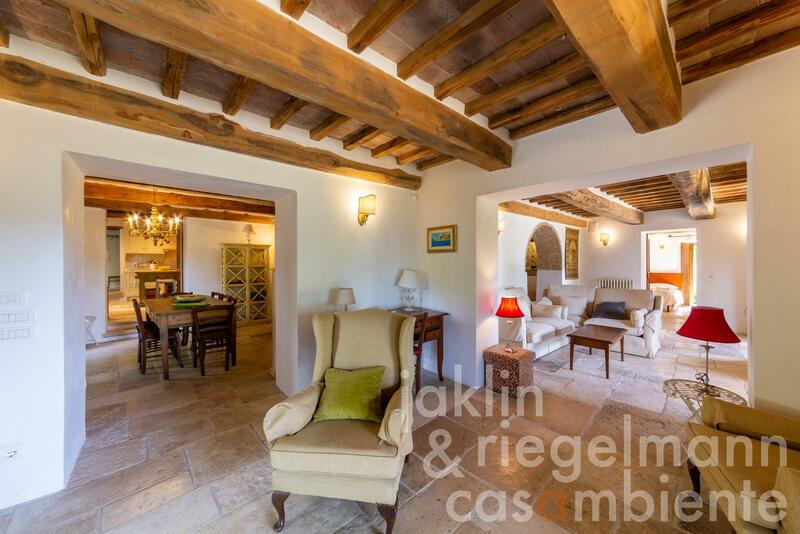 The manor house is situated on a large 5.5 hectare estate, was completely restored in 2002 and turned into a welcoming and charming country house with tastefully refurbished interiors. 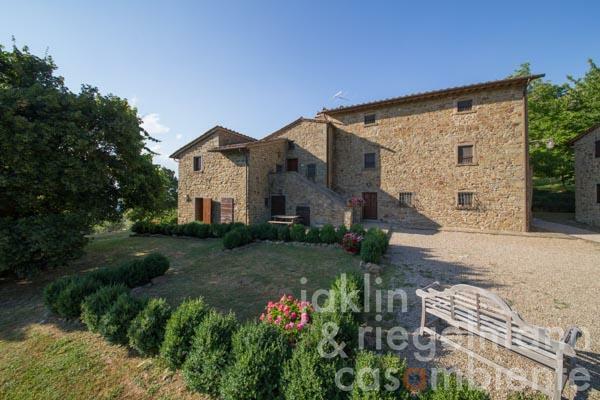 The main house has three floors connected internally but also with independent entrances for each floor, which could be useful for rentals or for a group of friends each having their own private living areas. 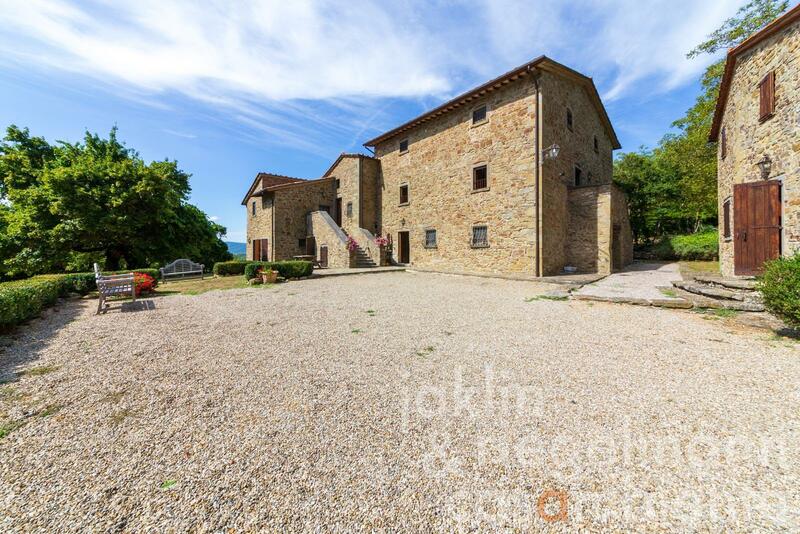 The ground floor features a grand entrance hall with fountain, small sitting room, dining-room, large fully-fitted kitchen with pantry, guest bathroom and laundry area, breakfast room, spacious L-shaped living room with fireplace, twin-bedded room with en-suite bathroom with shower. The living room doors lead out to a covered loggia, which overlooks the pool, gardens and the valley below. 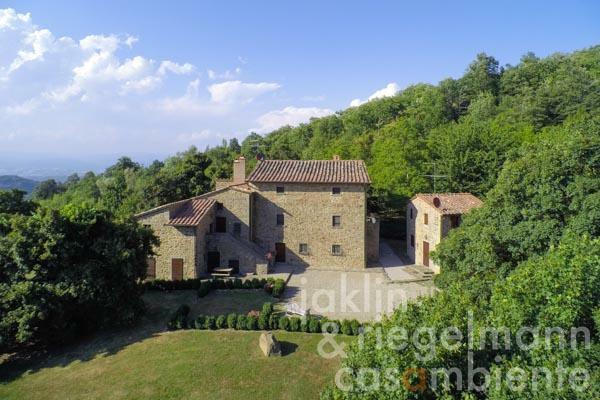 The first floor has a master suite with living area with fireplace, double bedroom and en-suite bathroom with bathtub and shower, across a hallway two double bedrooms, two bathrooms with shower and bathtub, living room with fireplace and access to the outside. The second floor is reached by a wooden staircase and comprises a separate apartment composed of a spacious open plan living area with fully-fitted kitchen corner and dining area, two double bedrooms and two bathrooms. The guest cottage has a small fitted dining/kitchen on the ground floor and a double bedroom with a shower room on the first floor. 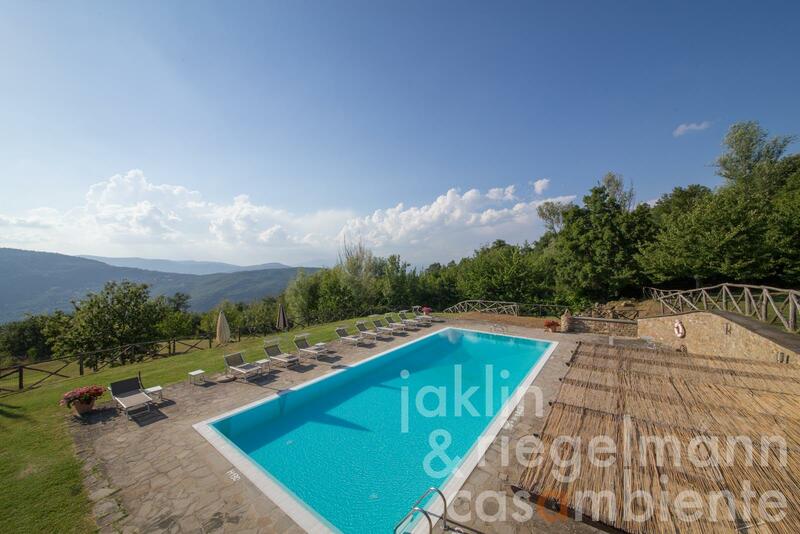 The large swimming pool offers wonderful panoramic views. 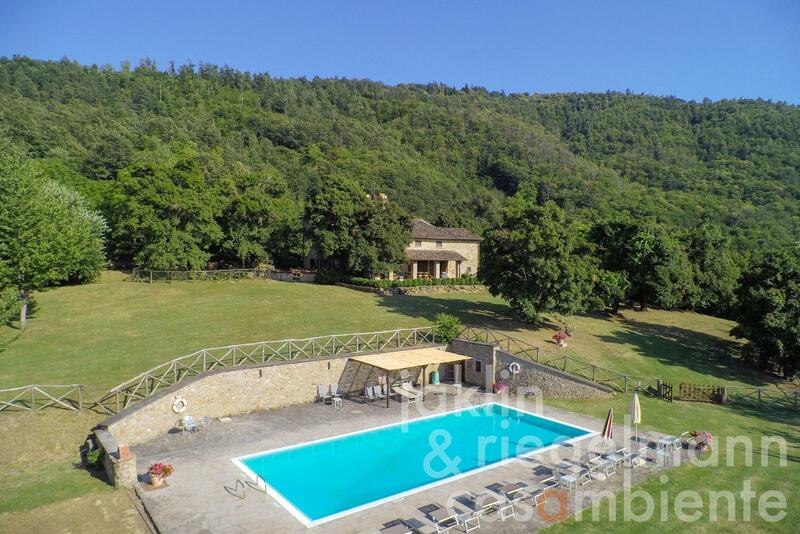 There is a summer kitchen, a changing room with toilet and a shower by the pool. The fenced garden with mature trees also offers a lovely pond with fishes. This property is approx. 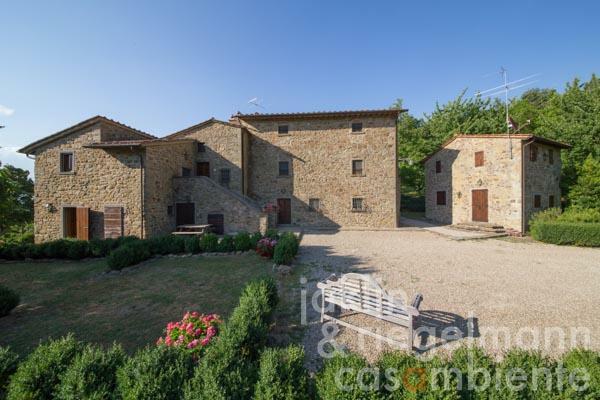 8 km away from the town Monterchi where a famous and important painting by Piero della Francesca (called "La Madonna del Parto") is preserved. 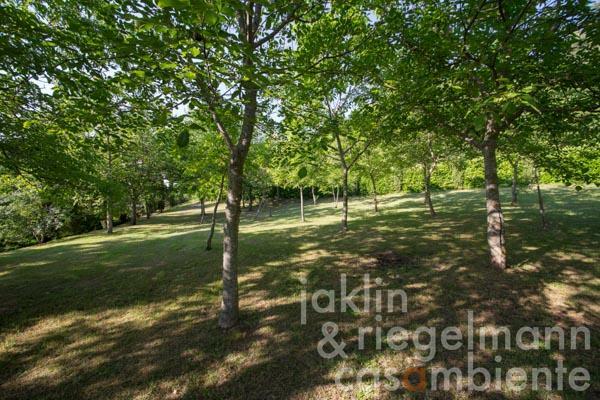 The access to the property is via a partially paved and well-maintained road of approx. 4 km. 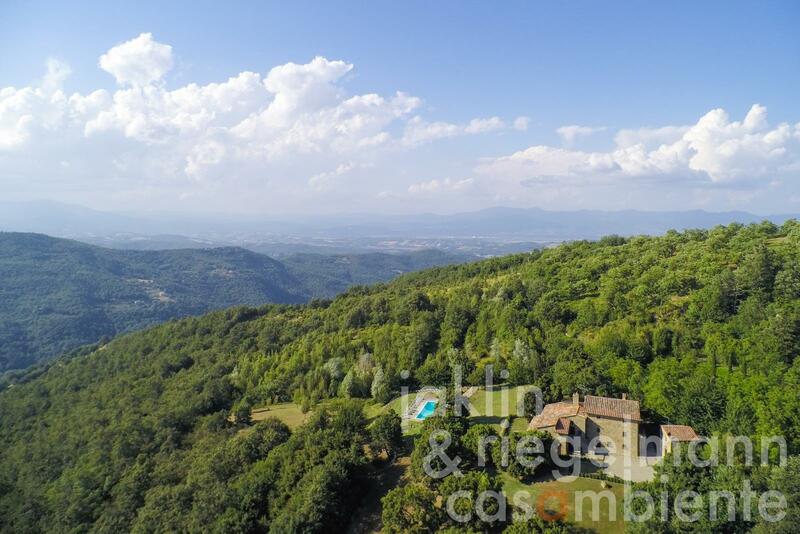 Distances: Monterchi (most amenities) 8 km; Anghiari 17 km; Città di Castello 20 km; Arezzo 35 km; Cortona 48 km; Perugia, Assisi 80 km; Siena 95 km; Florence 110 km; Adriatic coast 115 km. 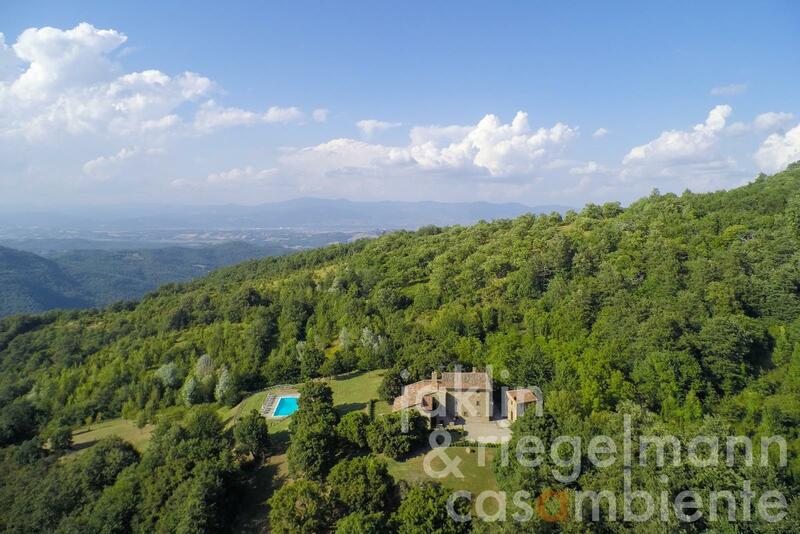 Airports: Perugia 71 km; Forlì 122 km; Florence 129 km; Ancona 157 km; Rome 268 km. 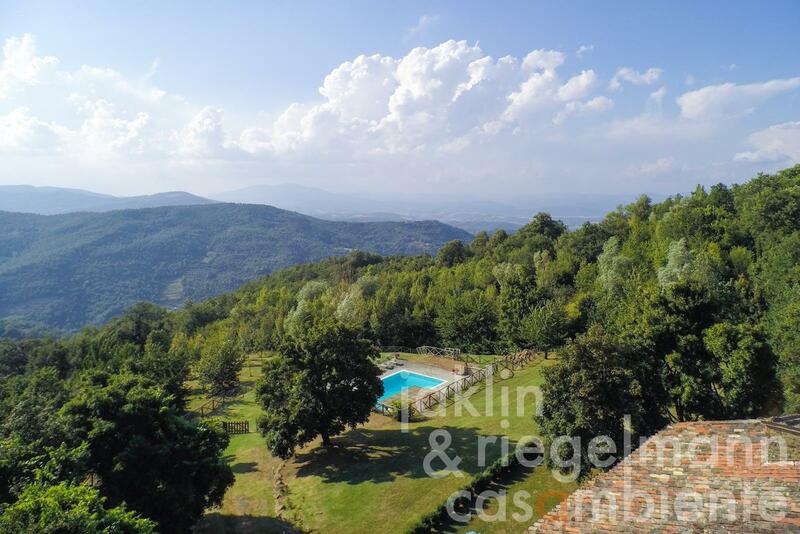 Italy, region Tuscany, province Arezzo, municipality Monterchi. 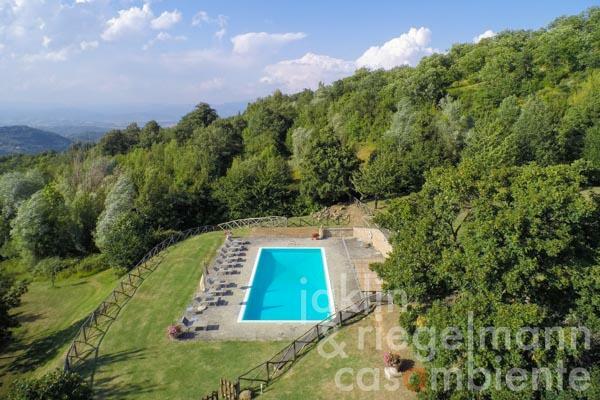 Electricity, own well water, central heating, fireplace, air conditioning, broadband internet access, satellite-TV, swimming pool, private parking, terrace, garden.